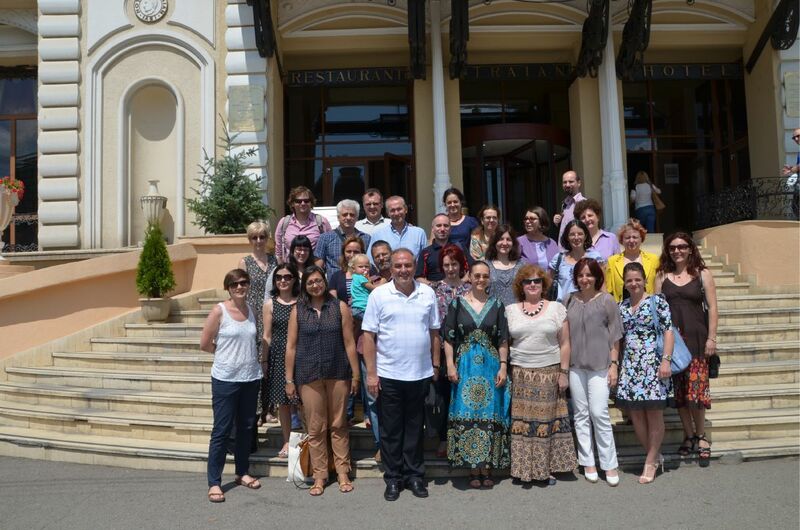 The city of Iaşi, in Romania, provided the setting for the pilot version of the SPACIT course, from July 8th to 10th, 2014. Project partners from Austria, Belgium, Germany, Italy and Turkey trained 28 in-service and pre-service teachers from Romania and Germany during 3 full days at the Colegiul Naţional Iaşi – the secondary school that is also partner in the project. “Spatial Citizenship”, co-funded by the European Commission’s Lifelong Learning Programme (LLP) – Comenius, aims to equip teachers with the learning tools necessary to support active participation of young citizens in the decision-making processes of their communities, through geo-media, such as digital maps and digital information shared through social media. The face-to-face course started off with an outdoor activity and lecture about the concepts and representations of space. The first module “Concept of Space” was then completed within the classroom, where the following modules were also taught. The “Concepts of Citizenship Education” module familiarized the teachers with democratic principles and fundamental human rights, while exploring the possibilities in active citizenship opened up by the new technologies. The “Geo-media Communication and Reflection” module underlined the importance of reflection and critical thinking of already existing understandings of space, also through the means of counter-mapping, which was carried out in the whereabouts of the secondary school. Geo-media Technology and Methodology were the topics of the fourth module of the SPACIT course, dealing with the practical use of digital geo-media in everyday life. Evaluations by the teachers/trainees about the SPACIT pilot course were very positive and comments focused on the new perspectives of learning environments inspired by the course. At the conclusion of the training, the project partners set the points of improvement to be made in the final months of the project lifecycle, and are now working to produce the final version of the Spatial Citizenship course, which will be available both online and offline by the end of November 2014. The news of the SPACIT pilot course was also covered by a local Romanian television channel. You can watch the video here. If you are interested in finding out more information about the project, please visit the project website http://www.spatialcitizenship.org/, its Facebook page “Spatial Citizenship” or contact Noemi De Luca at noemi.deluca@cesie.org.